I can't believe this final summer weekend before the kids go back to school is actually here. Tuesday I'll make the drive back up to Harrisonburg to help Stephanie move back into her college apartment and get Brandon all set up in the JMU dorms as he starts out his first year there. 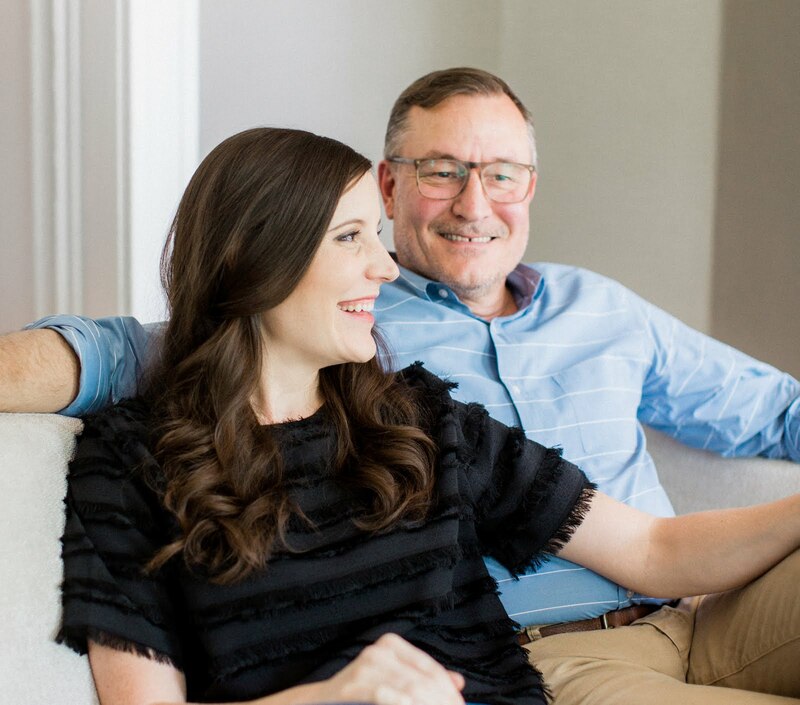 Mary and I couldn't be happier they will be there for 1 year together and while we're thrilled at where they both are in this stage of life — it's definitely flying by. The week before Stephanie first moved into the dorm, we celebrated the end of summer by taking them both on a tubing trip down the James River. 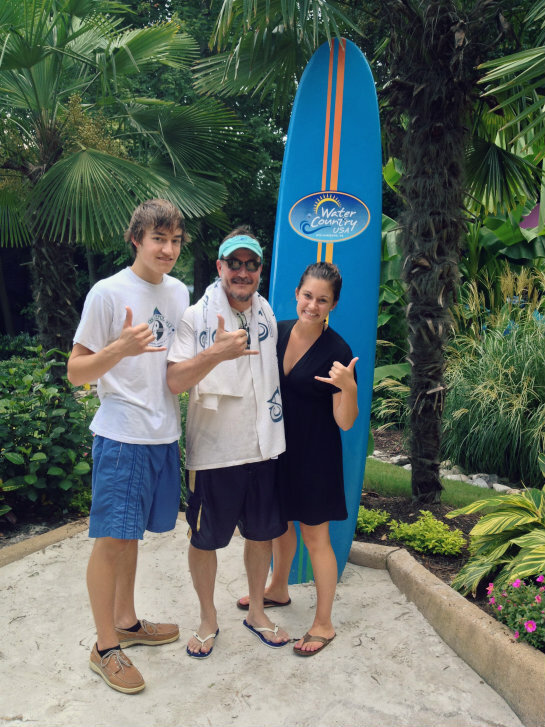 It was a fun way to spend some family together doing something active, summery and memorable at the same time. Now that Brandon's turn to move in is here, we wanted to do something similar to help celebrate him. 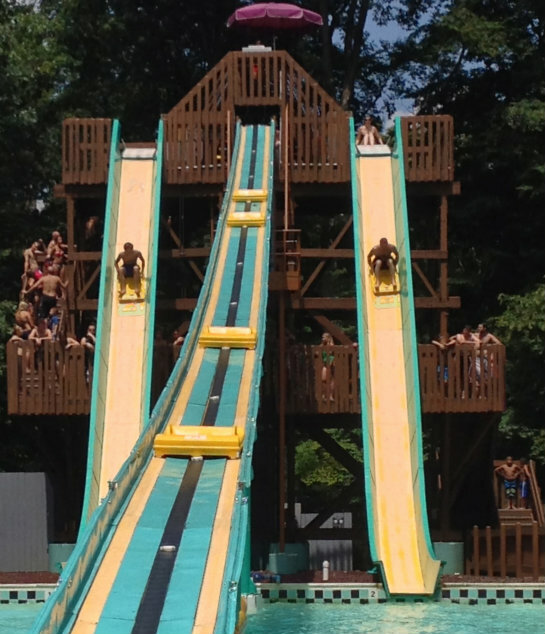 Instead of tubing, we thought it would be fun to go to Water Country USA, Virginia's largest water park. It's just about a 45 minute drive from our house and the park is doable in 1/2 to 3/4 of the day, allowing us to make what we wanted out of it. I used to take the kids when they were younger and Mary used to go when she was younger as an end of summer swim team celebration. Since none of us had been in probably 10 years (more for Mary), we had fun trying to speculate which old favorite rides and slides might still be there and which new ones we'd dare each other to try out — like the much anticipated Vanish Point. When we got to the park we snapped a few pics on the phone before sealing everything away in a locker to go get our water park on. The first slides we saw were those of Vanish Point — and they looked legitimately terrifying. We all went up and braved the open air straight down slide, which I'll admit made us all a little shaky. Stephanie and Brandon just kind of looked at Mary and I blankly when we tried to hurry back up the stairs to try out the drop slides next. The drop slides are so steep that they are encased tubes where you step into a skybox and you drop down when the floor drops out. I'm not kidding. Neither of the kids were game for the drop slide, so Mary and I joked in disbelief as we climbed back up to the top that the 2 older members of this family were the ones braving the slide. We were pretty proud to own these bragging rights. Mary hopped in the skybox like a pro and showed that slide who the boss was. I think we were both more than a little shaky after this one slide, but we kept straight faces as not to let on to Stephanie and Brandon. The rest of the day we spent trying out different water slides and swirling around the Hubba Hubba Highway which was a self propelled lazy river you can float around in wearing a life jacket. We thought it was a fun homage to the tubing trip we'd taken 3 summers ago with Stephanie. Just before drying off and heading out of the park, there was one last slide to crush — the good old Rampage. 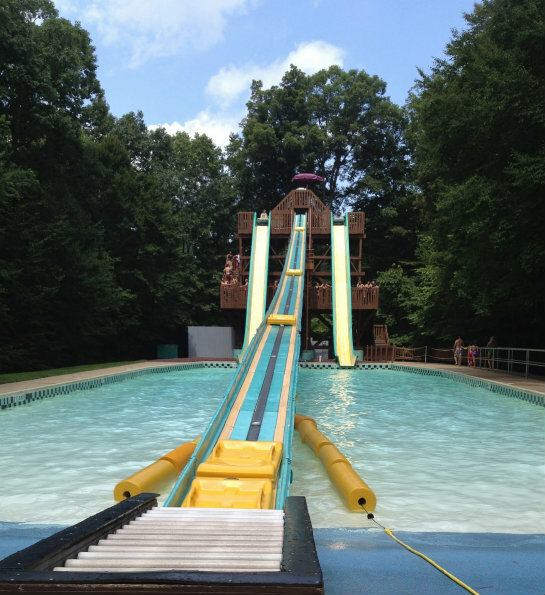 Back in the day, this was the steepest, scariest slide at the park. Compared to some of the newer slides, it looked pretty puny, but we know better than to judge a book by its cover. This is where Brandon came back for revenge on not taking part in the drop slide. He was determined to smoke old dad on this ride, but my competitive spirit doesn't die hard. In the end we called it a tie, but if there had been a clear winner you can bet we would have been bragging either way here on the blog. He was no match for my speed demon of a woman in the water. Stephanie sat this last slide out to capture the race between Brandon and I and get a head start on drying off. We finished out our time at the park by snapping a few final pics and spreading out towels near the car for a late lunch we packed in the cooler earlier that morning. 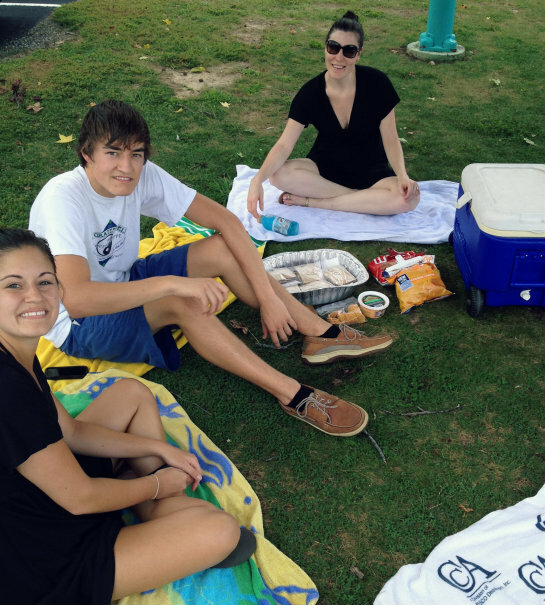 We got a little sun and had worked up a good appetite, so this little makeshift picnic was a great way to recap our favorite rides and chat about the big year ahead for both Stephanie and Brandon. 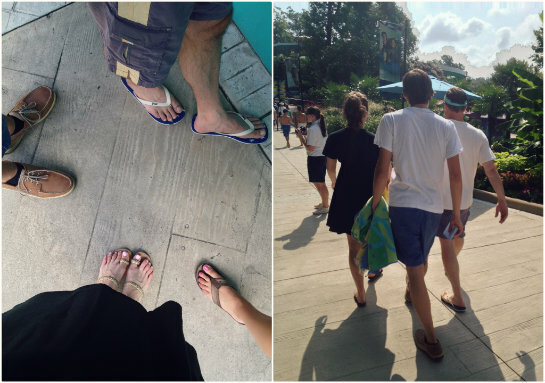 We all had a lot of fun visiting the water park and it won't be a memory we soon forget! 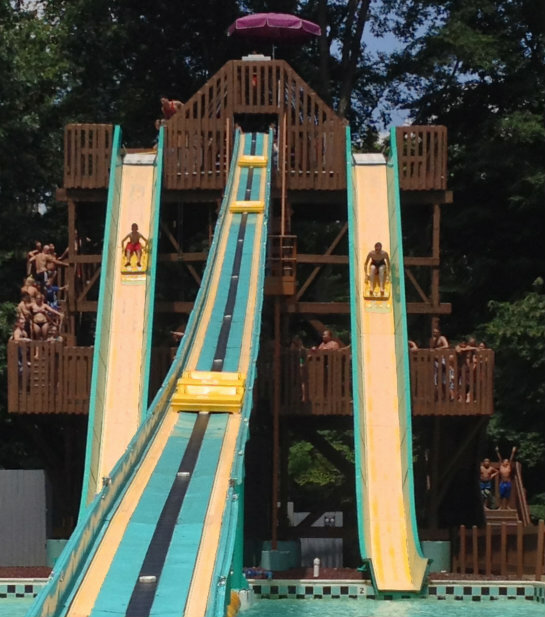 If you're in or near the Virginia area or planning a trip sometime soon, Water Country USA is a great water park to visit — it's a manageable size and as you can probably gather, makes for a lot of family fun for all different ages. Tip: If you're planning a trip to Water Country USA, we used the promo code bgwsubway for $14 off Brandon and Stephanie's tickets. This code should be active through September 2013 and makes for some nice savings! 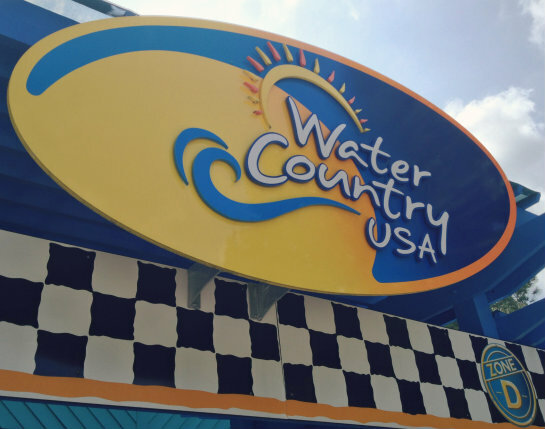 Water Country USA provided us with 2 press passes to visit the park and we purchased the additional passes for Stephanie and Brandon. All the memories and water park adventures are our own — thank you so much for supporting the sponsors that make 17 Apart possible. So cool I work here and cool that you blogged about it!!! Aww Brienna thanks for this comment we had a great time! We appreciate your readership!